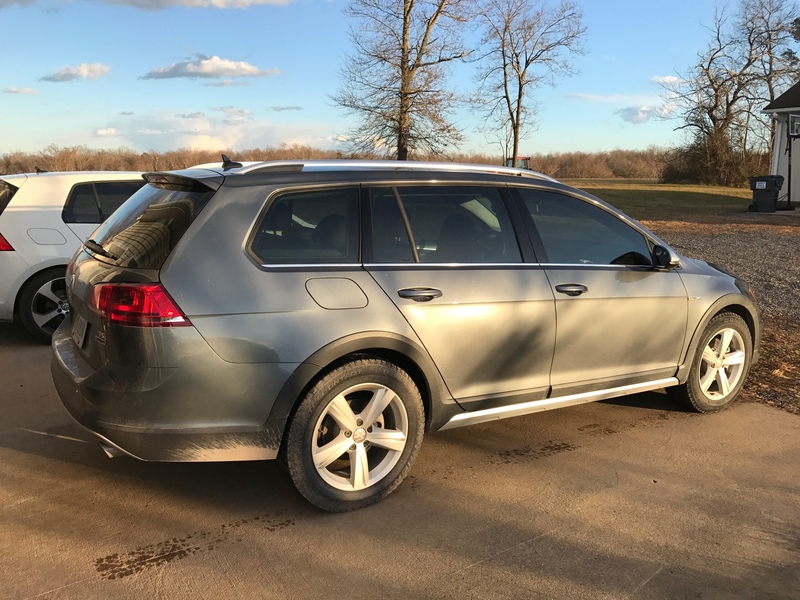 VWVortex.com - What did I do to my Alltrack, today? Thread: What did I do to my Alltrack, today? 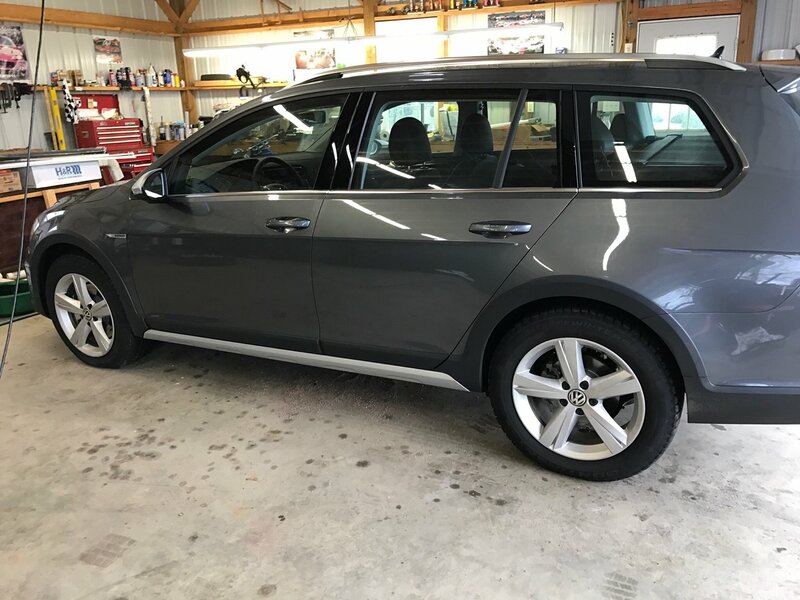 I took my Alltrack in for the second time for vibration in the seat,floor and steering wheel. The said one wheel/tire was off with roadforce so they grabbed one from another Alltrack and the tech is driving it this weekend. Hope that solves the problem. Changed out the only incandescent interior bulb in the trunk with a grid led bulb. Is that a 44mm festooned bulb? It is, had some that I bought for my allroad awhile back. Got them on ebay cheap from China but it works fine, and lights the trunk much better. Ah, yes, I did that too – the rear bumper plate. Forgot to mention. Easy to do. Helps with the dogs getting in/out of the vehicle without scratching the bumper. So I got my Alltrack back yesterday after road force balance and went for a ride with the dealers top tech. They fixed some of the vibration but he told me that all of the tires still registered in double digits after the balance. He did say that for passenger cars to drive smooth the numbers should be in single digits and possibly because the Alltrack has stiffer springs it wouldn't achieve the lower numbers or that the sub par Falken tires are to blame. Does any one else that has an All track with the Falken tires have the vibration problem or do any of you have any ideas. I have to get back to him after Chistmas as I will be driving 4 hours north to Maine which will be a good road test to see if it's acceptable. I don't want settle because why should I. I have a mk1 Audi tt and a B5.5 Passat that don't vibrate. The dealer is blowing smoke up your keister. Have them put on a new set of tires. Think about it, many 17" Alltracks have been sold and if it was a problem, we'd have a 50 page thread on it now. Not 24 hours old and already filthy. Getting winter tires on. If service gets denied by VW on replacing the tires then I will escalate the issue with them. Is that a dead body in the back? 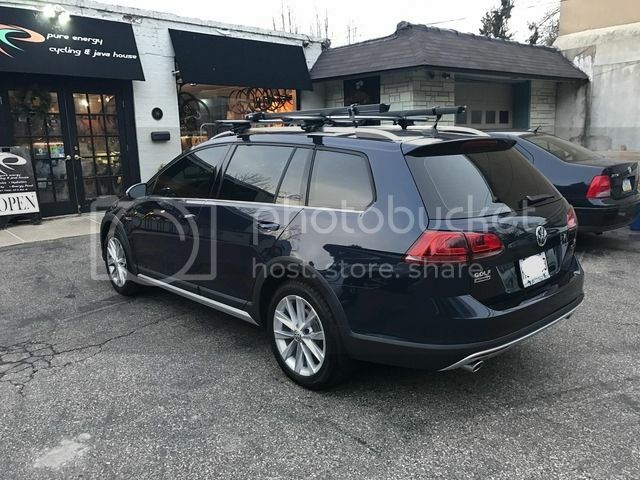 What did I do to my Alltrack today? 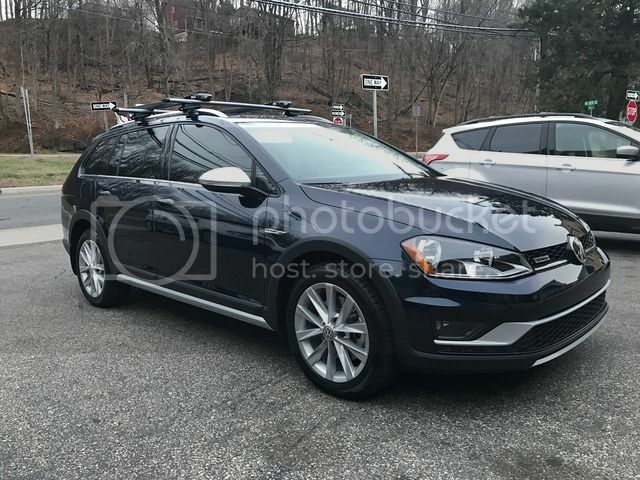 20% tint all around, installed my Thule Aerobars with bike trays. Took delivery yesterday and was able to complete lowered trunk mod, installed 65w h7 headlight bulbs (versus 55w stock, temporary until I get eds replicas), and Recaro baby seat. Deauto brake, trunk, glovebox and fog leds are on the way. Will post updates! Could you please tell me what headlight bulbs you bought? Osram H7 65w, German bulbs. I reused them from the mk6 tdi golf I had which was bought back. is the Recaro a forward facing or rear facing? Also, how is the space with one installed? I ask because we are expecting in March and still browsing seats. The recaro seat is forward facing for our 2 year old. Recaro seats are engineered for safety and heavily bolstered so it is a little on the big side and has a taller armrest. I do recommend it because it is simply a cool seat and very safe with not 1 but 2 cupholders! I will try to get pics later. We also have a 7 week old and we use the Britax base for that. Basically my wife and I both have the base and the little one can get passed between cars in the baby seat and locked in, rear facing. Also recommend just out of convenience because the baby seat also works with the Britax stroller. It's a very popular product, you see them everywhere with new parents. We have looked at some convertible seats but are finding them to be a little bulky in the rear facing configuration for these smaller cars. When our little one gets old enough to be front facing, I've had my eye on a Recaro. My wife had no idea what the brand was. You didn't see nothin'. NOTHING! New tint today. 35% all around. Sorry it's so dirty, but that's why I bought an Alltrack. 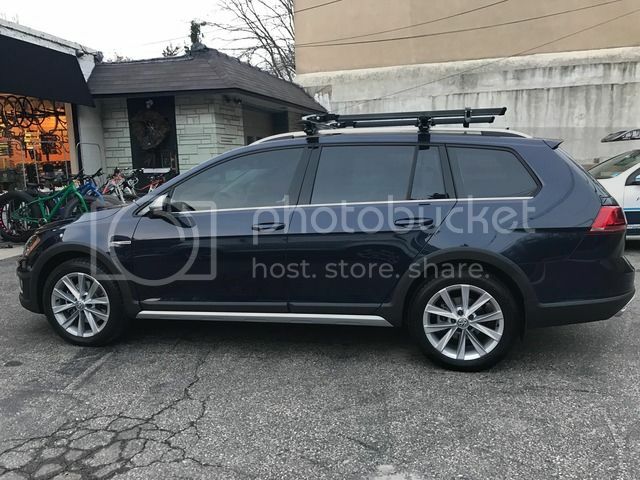 I picked up my Alltrack, to replace my Dieselgate Golf TDI, on November 30th but finally got around to giving it a good wash and waxing a couple of days ago. It was overcast so the white doesn't show quite as brightly in this picture as it would on a sunny day.